This entry was posted in adoption, adoption reunion, adoptive parents, grapes, hopelessly delussional people, petunia, search for birthparent, stupidity, Uncategorized. Bookmark the permalink. And room for a pony? I said that Violet had room for a pony, and a Mercedes. I did notice that. I just figured she didn’t know the difference between, post punk, goth, new glam, and metal. She just pulled a shot form an image search. darn….can’t get her site to come up…. Sorry Anne looks like you are going to have to copy and paste, WordPress won’t let me link it. I know you aren’t a stalker, you would be really terrible at it. you just have to push the link button and copy it Addie, you know where you modify the posts I just figured it out. warning flag to this a/mom not telling a/parents about bio’s WHY?? something stinks in Petunia’s garden perhaps pony poo? That’s how i had it first, Joy. It took me back to my page with an error message. I think it’s because it’s a google blog. Oh Anne, pony poo, yes lots of pony poo there. 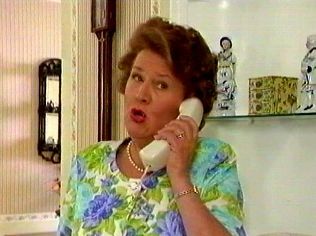 Oh I meant code on Hyacinth’s part, not yours. That is one of my all time favorite shows. I didn’t get it because I’ve never heard of Hyacinth Bucket. I had to go to Wikipedia to find out what you were talking about. Now I want to see that show. That is one of my all time favorite shows too. Must be why I like you and Joy so much. I have been a huge fan of many many British sitcoms since I was a teenager (that’s almost 40 years). How can anyone not love this show, well almost anybody. I’m not seeing my amom getting it either. She actually sings AT people too. Showtunes. My favorite might be when Hyacinth furnishes her ‘country estate’ with the genuine reproduction petite Queen Anne furniture. Issycat, I have a feeling you will love the show. If you have BBCAmerica, it’s still on from time to time. My favorite episodes are the ones where Hyacinth tries to keep the other side of her family out of sight – especially Onslo. My amom was always MORTIFIED by my adad’s sister and her family – especially, of course, if anyone “important” saw them with us. They were our closet cousins. Come to think of it, if I had met a pig farmer years ago, I probably would have married him just to piss off Hyacinth – er – my amom. Oh, geezus – Limoges, Spode, Lladro, Royal Doulton, Diane von Furstenberg, Lilly… the Junior League, hospital charity balls (mostly the ball gowns) gawd, that woman would drool over the stupid stuff, and talk about designers and drop names and then gasp when someone talked about their (yikes!) feelings. “Keeping Up Appearances” was/is one of our favorite shows as well. I think the whole show could have an adoptee theme run through it cuz there seems to be a lot of similarities. I agree Julie. Some of the most “down to earth” (literally and figurtively) have the fewest screens and are the most honest, in your face, folks. BTW, my uncle was a pig farmer and he had a story about everything. The other Britsh sitcom we use to watch followed Keeping up Appearances….trying to think of the name but the setting is a department store and one of the salespersons was gay. It was hallarious! I often wonder just how well received shows like these shows would be today if just coming out….same as “All in the Family”…. Addie… OMG she sings showtunes AT people? That is too funny. Tell more. Joy, the back-seat driving and control stuff were where my amom and Hyacinth parted ways. My amom was actually very subservient – yet completely preoccupied with “what the neighbors will think,” etc. Lee, it was “Are You Being Served?” And oh yeah I could just see Hyacinth being mortified as her “closed adoption era” adoptee came out and proudly proclaimed herself a b-a-s-t-a-r-d, or….oh you are right – too many similarities to count because (infant) adoption is so classist (the industry exploiting each class in its way). I love the one where Hyacinth is buying a new counter top so she opens her bag, takes out all of the ingredients and sets about making biscuits right there in the store to make sure the countertop is going to work properly. If Sheridan were adopted it would explain a lot. Sheridan is just too much like his Mummy to be adopted. BTW, Petunia has commented, on the wrong post. It’s the one just below this. I asked her if Richard drank.